Improving your general fitness can make a huge difference to your skating game. It’s obvious that having strong legs will be helpful in roller derby (in case you weren’t aware you need to get low!) but that’s not all there is to this skating lark. As you progress through each level of derby it can feel like starting all over again as you meet a new level of intensity. 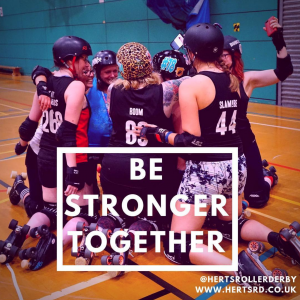 To help you on your journey, we asked Hertfordshire Hell’s Belles’ Magpie to share her top tips for getting fit, staying fit and staying motivated. It’s so valuable to exercise outside of standard derby practice – especially if you’re only training once a week. Off-skates exercise helps you build strength and improves your endurance, which is going to be really important once you’re part of the team and need to keep skating your hardest for a full bout. I train with HRD twice a week on skates and I aim for two off-skates workouts a week. But if you really want to see a difference quickly, I would aim to exercise three times a week. Full disclosure – I am a fully reformed couch potato! I only really made these changes once the derby bug had really bitten. After literally standing facing backwards and trying to will myself to move (I just did not have the inner leg muscles to pull my feet together!) I set myself the goal to improve my backwards skating. So I spent time on the abductor machine at the gym to work on that muscle group and steadily made progress on skates as I built up those muscles too. Having a few sessions with a personal trainer to identify your weaknesses and really understand the exercises that will help with those can be really valuable, but not everyone can afford a gym membership or PT. If that’s the case there’s still no excuse. Go for a run to burn fat and improve your endurance – start small if you need by just going round the block, then the next time go twice round, and the next time try two blocks. If you work in an office building, ban yourself from using the lift and time yourself taking the stairs – by the end of a month we bet you’ll be enjoying your own Rocky moment at the top! Check out the free 7 Minute Workout app on either the App Store or Google Play. The app is preloaded with loads of workouts starting from as little as 7 minutes. You can choose your workout by length of time, intensity, what parts of the body you’d like to work or you can create your own smart workouts covering what you want and need. The best part is it explains how to do each exercise effectively and doesn’t require any special equipment so you can workout at home, in the park – wherever you like! ← Early bird tickets for our home game are now released!